The former Stadsverband of Batavia was newly built in the suburb of Salemba. 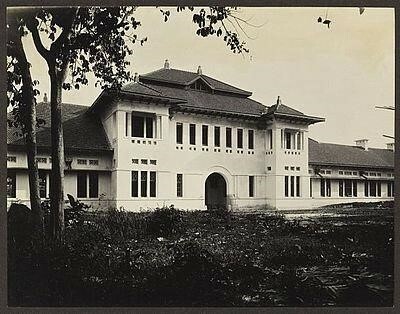 It was one of the three central government hospitals of Java (CBZ). It was opened at the first of November 1919 after the old stadsverband had functioned for a century. The new hospital was built according to the prevailing pavillion design. This type of architecture was recommended for all tropical hospitals. The new building was constructed next to the new STOVIA (Training Institute for indigenous doctors) on a spacious terrain. The first floor of the new building measured some 1,000 meters. The hospital had all wards and rooms characteristical of a modern hospital at that time, including a water-pumping station, kitchens, offices, engine-rooms and lavatories. In order to modernize the organization structure of the central government hospitals, the function of stadsgeneesheer (city doctor) was repealed for the 3 cities on Java. These city physicians had been responsible for the health care of the city population and the management of the stadsverbanden. From then they became medical directors of the CBZs (Central Civil Hospitals). By 1930, the number of occupied beds of the CBZ Batavia had increased to 838 (in 1910 it was 283). Its annual budget was in the meantime over f 1 million guilders. Nowadays (2013), the hospital still exists under the name Rumah Sakit Umum Dr. Cipto Mangunkusumo and is located on the Jalan Diponegoro 71. The hospital has a Ministery of Health registration no. 3173014 and is classified in the A category of hospitals. It has 817 beds capacity (98 VIP, 93 first class, 56 second class and 570 third class). It has 385 doctors and 269 student doctors. It had 601 nurses (qualified) and 1,401 with lower qualifications, including student nurses. The hospital treated recent years 956,849 outpatient clients and admitted on an annual base 48,068 inpatients. The number of nursing days was 33,189. The inpatients stayed on average 5 days. The occupancy rate was 70.77%.